First Wind retained HMMH to undertake a noise study in support of the Act 250 Section 248 permitting process for the proposed Sheffield Wind Farm located in northeastern Vermont. 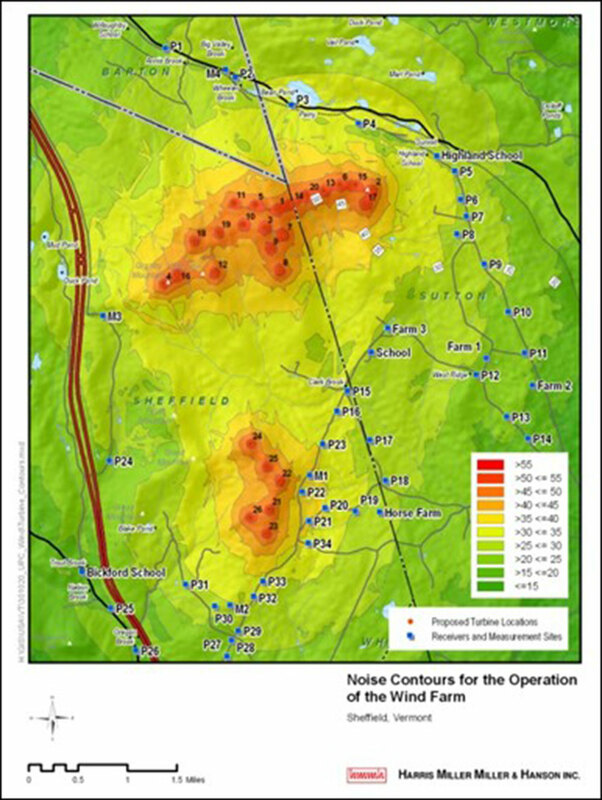 HMMH performed a multifaceted noise study that included a measurement program to document background (ambient) sound levels at representative locations in the communities surrounding the proposed site. Since neither the State of Vermont nor the local jurisdictions had applicable noise ordinances or criteria for the evaluation of wind farm noise, criteria were developed as part of the study. Projected noise levels were carried out for different layouts of the proposed wind farm. HMMH also prepared written testimony in support of the Act 250 Section 248 permitting process, and provided live testimony before the Vermont Public Service Board. Noise exposure contours developed for one of the preliminary layouts of the wind farm. HMMH utilized the SoundPLAN® (developed by Braunstein + Berndt GmbH) computer noise model to produce the contours and to calculate sound levels from the operation of the wind farm at specific noise-sensitive locations.